Last night, B had his school play. I'd like to make a couple comments about his wiggles. First, it was after bedtime. He's always antsy at night. Secondly, believe it or not, this is a huge improvement over the Christmas play :). Speaking of wiggles, sorry about the shaky-cam. I really need to put a tripod in my vest. B: Superman is from the planet Crouton. B: I have to pee in the uterus. Me: That's not a uterus, it's a urinal. We love our OB. He is really wonderful! Probably our favorite thing about him is that he has the ultrasound equipment right in his office. And he USES it. So every 2-3 weeks we come back, get another ultrasound, and most literally can watch our baby grow in the womb. Our first visit, Seven was 1.8 mm (just a tiny embryo with a pulse that will later be a heart beat). The next visit, Seven was 17 mm (with a head and a spinal column, no limb buds yet). So Thursday, we went in again, expecting to see limb buds added to our little embroyo. We were so surprised at how much he/she had developed. This 30mm (3cm) little one now had the neural tissue for a brain, a spine, a primitive heart, little arms, legs, feet, hands, umbilical cord, and even a functioning urinary system. Wow!!! There's a tiny baby in there! Wiggling his/ her little legs and arms and everything. Quite proud of the tiny one! And a momentary sigh of relief for us as parents. So it cracks me up what percentage of my decisions these days are based SOLEY upon whether I think I will throw up. I'd say 25% of my thoughts are centered around avoiding hurling. Seriously, if I think I'm likely to hurl, I don't care how important it is- it's a deal breaker. It just ain't gonna happen. Of course, another 20% involves what and where I think I can acquire food that I can eat. Add to that the "mmm. What can I take off my plate so that I can get some rest?" (Another 15%), and there just isn't much left. That's right---So basically folks, I'm walking around with less than half a brain. Like a hormone crazed teenager who's only thoughts are about boys (ya, I remember when I was that girl). Except now the survival instinct in play is how to keep myself and this baby alive (rather than how to get JoeBob to notice me). My life is monopolized by my hormones. For the record, taking care of my amazingly kind husband and absolutely delightfully energetic little boy consume another 30%. With 10% left over for other family, work, church, housekeeping, and anything else that might normally be important to me. So, If you are in that other 10% and I acknowledge your existance at all, it is an act of undeniable love. 'Cause this chica doesn't move from sleeping position for just anybody/ anything. Even a simple phone call...that requires me to acquire my phone when I'm not sleeping, too exhausted to move or talk, trying to acquire food, or too naucious to look the phone. As many of you know, B loves all things John Williams. He seems to have recently rediscovered Superman. As lucky timing would have it, a very nice family with a boy about a year older than B gave him a bunch of old pajamas. 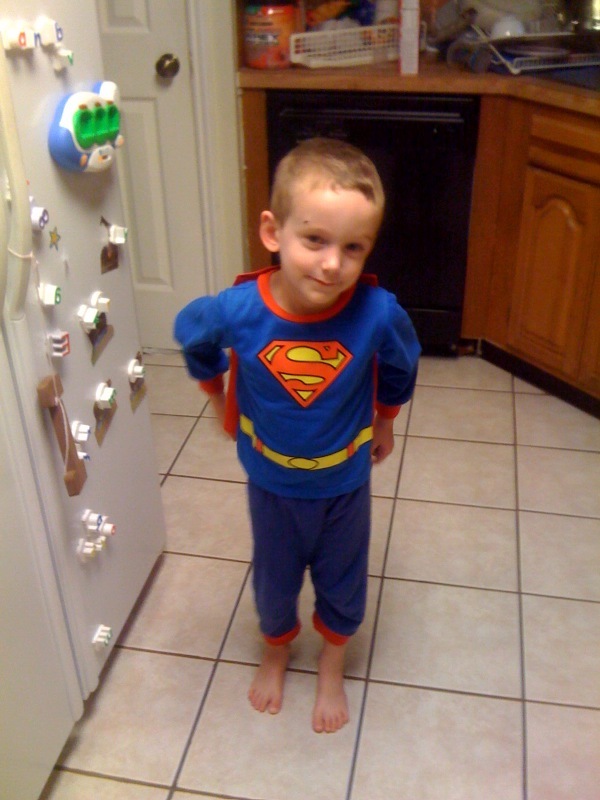 Apparently the other boy loved Superman, because there were several Superman pajamas in the mix. B's had them for a while, but hasn't cared until now. We're at the Houston Zoo today. 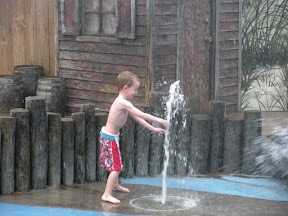 They have a little water play area. A little boy here just said, "It's a good thing I don't have any electronical devices!"